We have lost a friend. So young a man, so fine a Shliach, so short a life. And even as we have accepted in faith all that has come to pass, “Baruch dayan emet”, we are still left unable to stem the flood of tears. We are left with a raw cry of pain. Levi was such a powerful soul. He loved Shlichus, he lived Shlichus. Shlichus was the very air he breathed. He loved people. Through him the verse, “V'ahavta l'reacha kamocha— love your neighbor as yourself” leapt off the page and was brought to life, to its full meaning. He had the ability to sense the good in people and bring out the best in them. He brought many Jews back to Torah and tradition, all the while sharing his warmth, his radiant smile, and thunderous laughter. Levi had a gift for friendship. In the enormous synagogue that is Lubavitch world headquarters, he, at age twelve, sought out the lonely, invited them to a Shabbat meal at his parents’ home, and drew them into his circle. His family’s Shabbat table was delightful, always full of guests. Their home was open and the atmosphere was warm, colorful, and charged with energy. Everyone sensed it. I know this, because I, Levi’s age, was a boy from out of town, and often his guest. My friendship with Levi grew. I spent time with him in his parents’ home and years later, in his own home. He was such a loving son to his father, Reb Zalman of blessed memory, and to his mother Cyrel, may she live and be well. He was such a loving husband to Miriam and such a loving father to Chaya, Mirel, Mendel, and Zalman. He gave and he received so much love v'ahavta l'reacha kamocha was the very texture of his life, the fabric of his existence. And we have lost not only a wonderful human being, but a leader as well. Whether in Jewish student life at Oholei Torah, or as a counselor in camp Gan Israel, or as the founder of the flourishing Chabad Community Center in Tysons Corner, Virginia, Levi expended his energy to better his community and he succeeded. In particular, the Chabad Tysons Community Center occupied his last ten years and will surely stand as his living memorial. Whatever occupied Levi he led. That strength of character, as much as his warmth, was part of his fabric. “Tracht gut vet zein gut.” When he saw something was going wrong he would not complain. He would not wait for others to act. He would say, It will be good, and let me be among the first to make things right. And his strength and energy were such that he brought a community along with him. They were inspired by his optimism, his faith in G-d, his vision and courage. They were drawn to him, and in return he drew out the best in them. He made you believe in a brighter future. A year ago, during Levi’s illness, he lost a beloved family member suddenly. When Levi’s relatives gathered, naturally they spoke of the pain and deep sadness they all felt. The mood was despondent. Then Levi, who was going through chemotherapy, rose. He spoke for nearly one hour about faith, optimism, and moving forward during difficult times. I was told by family members who were present that his was the most invigorating and visionary talk they had ever heard. And consider that at the time, Levi was blind because of the treatment he was going through. There is a blessing of thanks we recite each morning, Asher Yatzar, thanking G-d for the intricate wonders of the human body. The end of the blessing states that G-d is “mafli laasot”, that in fashioning the human body, G-d acts wondrously. 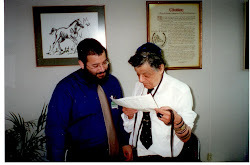 The author of that blessing was the Talmudic sage, Rav Shashet, who was blind. Imagine the vision granted to that sage. He did not see what was visible, but he saw what was essential. Like Rav Shashet, Levi always had the vision to see beyond the looming darkness and to fill the room with light. Before the High Holidays I called to see how he was. Levi answered the phone. He spoke about the New Year and its possibilities. He had prepared his High Holiday sermons but because of the loss of vision he was unable to focus on the text he had written. Undeterred, he asked his extraordinary and graceful wife to read it to him over and over so that he could consign it all to memory. And he did, so that even in his weakened condition he could share his thoughts, share his strength, with others. Not once in those last months and years did he let his suffering affect his public face or private faith. He became yet more giving to others — hearing that some of his colleagues were in dire financial straits, he came to their aid. Wracked with pain, he commanded his face to smile. Despite losing his vision, he continued to learn Torah and teach. It was an act of pure will, day by day, hour after hour, a testament to the human spirit. And Levi refused to be afraid. Some thought him to be naïve. But he wasn’t. He had seen the Angel of Death face to face and said: No. Even if you take me, you will not defeat me, nor will you intimidate me. There are people who teach us how to live when all is well. Levi was one of those rare souls who taught us how to courageously live when things are not, and never to give up. He remained undefeated, undiminished, and thanking G-d for existence, for love, to the very end. For three years Levi fought his devastating illness, long and hard, beyond all the normal limits of courage and strength until finally, on Shabbat, for all his resilience of spirit, his body could hold out no longer. It was a terrible struggle not just for Levi, but for those who loved him and were so close to him, for his community and his incredibly wide circle of friends across the world — there were thousands who kept in touch. I never knew of anyone who had so many admirers and friends. They followed Levi’s illness day by day and prayed for him daily. Wherever he went in his life, he created an ever widening circle of influence. He was one of those people who was not only good himself, but was able to bring out goodness in others, to let goodness ripple outward like powerful waves in a great ocean. And today we are all bereaved and bereft. Hashem lent us Levi for all too short a time, but in that time he lived a life of such joyous optimism and accomplishment that his imprint became indelible. I don’t think Levi was aware of how many hundreds and thousands of people were touched because of him. Of how much light he let in—even when he could no longer see. And now the Ribono shel olam is holding his hand. Levi has left us with his spirit and his memory, which will continue to live on. We will never cease to thank G-d for this, even in the midst of our tears and our grief. May Hashem comfort his beloved family and friends. May He give strength to Miriam. May He bless and look after Chaya, Mirel, Mendel, and Zalman and be with them every inch of the way. May Levi live on in them, and in us, and may we honor his memory by becoming better, stronger, and kinder. May his soul be bound in the bonds of everlasting life.